Jet aircraft began replacing propeller-powered planes in the late 1940s. Differences in handling resulted in a high accident rate among pilots unused to the new aircraft. Lockheed developed this plane, the T-33 Shooting Star, to help pilots make the transition to jet aircraft. Called the T-Bird, the T-33 Shooting Star is a slightly longer version of America's first jet fighter plane, the F-80. The T-33 made its first flight in March 1948. Powered by Allison J33-A-23 turbojet engines, the original T-Birds reached a speed of 600 miles per hour. Lockheed manufactured this popular airplane until August 1959. Over 5,690 T-Birds rolled off their assembly lines. The aircraft's clean lines and solid performance made it a favorite of pilots around the world. Many remain in service today, more than sixty years after their first flight. 2. The T-33 Shooting Star & the marker. 3555th Combat Crew Training Wing at Perrin Air Force Base, Texas. In the fall of 1955, the Air Force moved this T-Bird to the 3615th Flying Training Wing at Craig Air Force Base, Alabama. Early that November, pilot William Pettit Boyd had a landing accident. 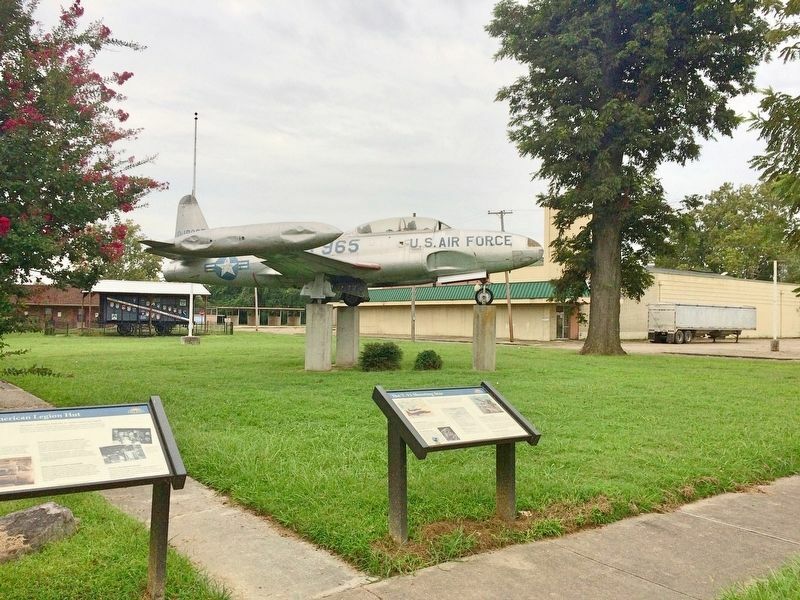 Soon afterward, the plane was transferred to Tinker Air Force Base in Oklahoma. No. 51-8965 remained in Oklahoma until early 1964, when the Air Force assigned it museum status. Richard L. Kitchens Post No. 41 acquired the plane on loan from the U.S. Air Force in the mid-1960s. Erected 2012 by City of Helena. Location. 34° 31.68′ N, 90° 35.291′ W. Marker is in Helena, Arkansas, in Phillips County. Marker is on Porter Street east of Pecan Street, on the right when traveling east. Touch for map. Marker is at or near this postal address: 406 Porter Street, Helena AR 72342, United States of America. Touch for directions. Other nearby markers. At least 8 other markers are within walking distance of this marker. The American Legion Hut (here, next to this marker); Arkansas' Mercí Car (within shouting distance of this marker); The Irish Immigrant (within shouting distance of this marker); Patrick Cleburne in Helena (within shouting distance of this marker); General Patrick Cleburne (within shouting distance of this marker); Phillips County's Confederate Soldiers (within shouting distance of this marker); Seven Confederate Generals (about 300 feet away, measured in a direct line); Civil War Comes to Arkansas (about 300 feet away). Touch for a list and map of all markers in Helena. 1. Army medal left at marker. Despite being an Air Force aircraft, someone has left an Army Achievement medal on top of the marker (see photo). — Submitted September 5, 2017, by Mark Hilton of Montgomery, Alabama. More. 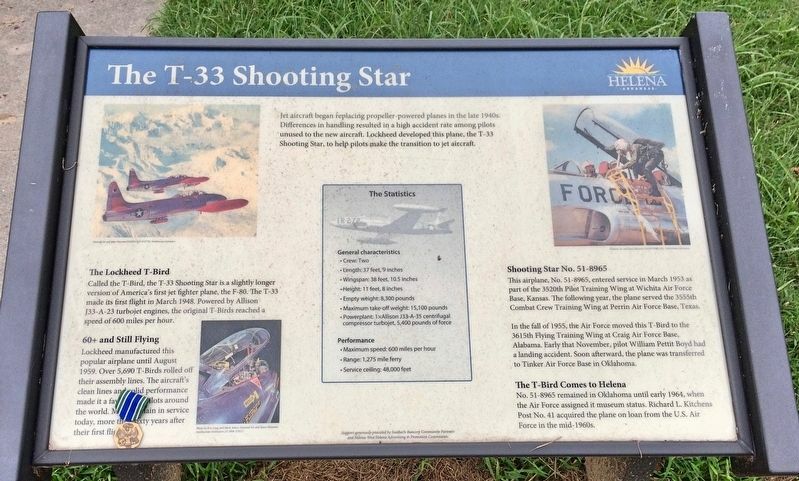 Search the internet for The T-33 Shooting Star. Credits. This page was last revised on September 5, 2017. This page originally submitted on September 5, 2017, by Mark Hilton of Montgomery, Alabama. This page has been viewed 115 times since then and 8 times this year. Photos: 1, 2. submitted on September 5, 2017, by Mark Hilton of Montgomery, Alabama.